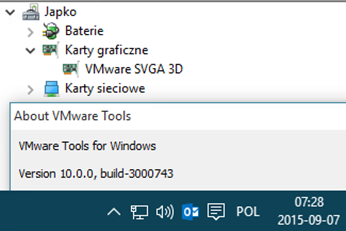 On 09/03/2015 VMware released VMware Tools 10.0.0 (without much publicity). This version is fully compatible with vSphere 5.x and 6.0, at this moment it should be downloaded yourself. The most important change is the addition of support for Windows 10. After installing in Windows 10 a new version of VMware Tools system is properly recognized in vCenter, there are also new drivers, including the graphics card!